Rack bolts are a stylish and discrete option but they are more fiddly to fit. 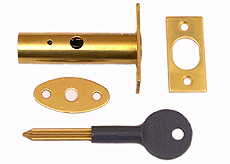 They can be used on windows and are also often used on wooden doors e.g. back doors where they are usually positioned top and bottom to give extra security in addition to a lock on the door handle. 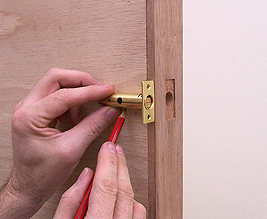 1 Make a mark in the centre of the side of the door where you want the bolt(usually near the top and bottom). 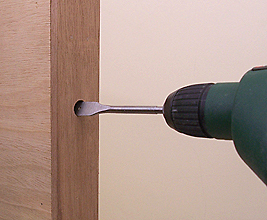 Drill a hole with a flat bit to the length of the bolt. Try to keep the drill straight and level. Tip put a bit of sticky tape on the drill bit to mark the depth you need to drill to. 2 Slide the bolt into the hole. Using a very sharp pencil mark around the bolt plate. 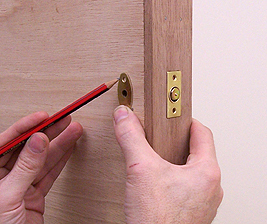 4 Next, carefully measure the distance for the key hole using the bolt . Your rack bolt may come with a marking template to help with this. Drill a hole slightly larger than the key. 5 Position the key plate over the key hole and screw it to the door. Insert the key and check that the bolt is moving in and out. 6 Now you need to locate the bolt hole on the door frame. This requires careful positioning. 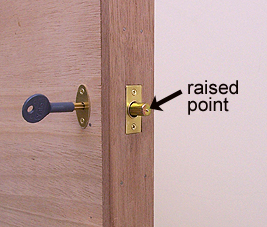 This is best achieved by closing the door then locking the rack bolt onto the door frame. Some rack bolts have a tiny raised point in the middle which will create a little mark in the frame when you do this. 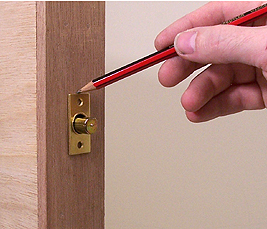 Tip If your rack bolt doesn't make a mark on the door frame when you lock it rub a wax crayon or something similar on the end of the bolt. 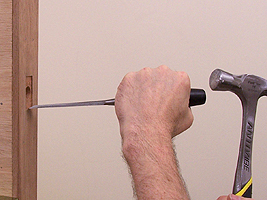 Close the door and lock the bolt onto the door frame so it leaves a mark. Drill a hole for the bolt just slightly larger than the bolt. 7 Position the cover plate over the bolt hole. 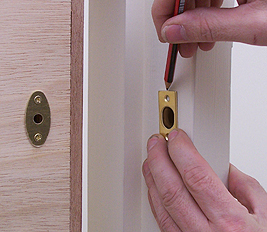 Draw around the cover plate then chisel out a recess similarly as you recessed the bolt (shown above). When you're happy with the position, screw it in place.